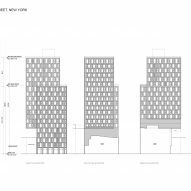 The unusual massing of this 21-storey residential building by US firm S9 Architecture responds to development rights that were purchased for airspace next to the New York tower. 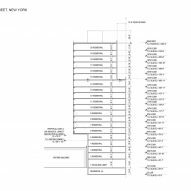 The condominium tower, called 160 East 22nd Street, is located in Manhattan's Gramercy Park district. 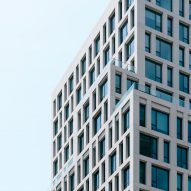 Encompassing 116,000 square feet (10,776 square metres), the building contains 84 luxury apartments and ground-floor retail space. The area's historic architecture was reinterpreted for the design of the tower, which occupies a corner site. 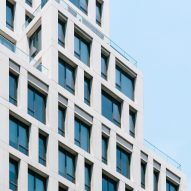 "The design is based on a modern interpretation of the elegant and timeless classic pre-war apartment buildings in the neighbourhood," said S9 Architecture, a New York-based studio that designed the building while formerly affiliated with Perkins Eastman. 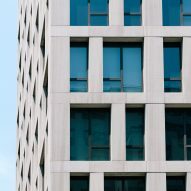 The exterior features windows set within a gridded limestone facade. The building's sculptural form responds to the city's setback requirements, along with development rights for neighbouring airspace. The central portion of the building cantilevers 24-feet (seven metres) over an adjacent low-rise structure. 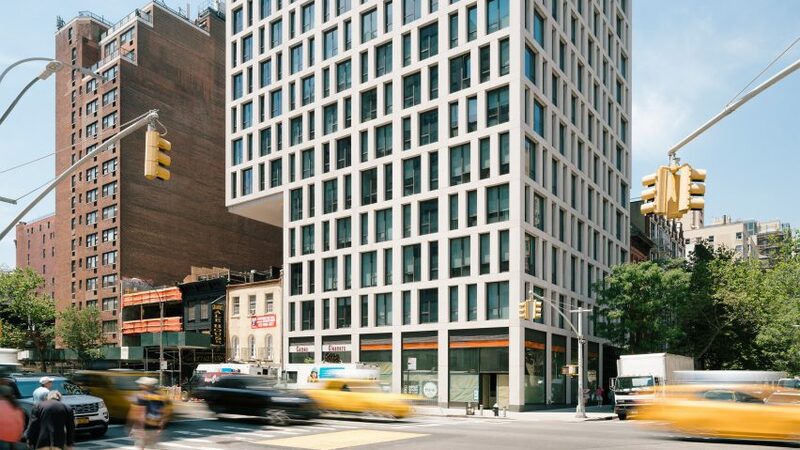 "The building's dramatic signature cantilever was conceived to successfully incorporate additional development rights purchased by the property," the firm said. By incorporating the setbacks in the top levels of the tower, S9 was able to create terraces for residents. At the ground level, the entrance is surrounded by metal latticework. 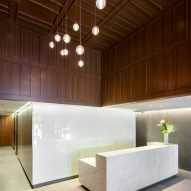 A lobby features marble finishes and walnut wall panels, lending a "sophisticated, traditional touch". The architects sought to create an interior environment imbued with classical proportions and a contemporary character. "A well-balanced variation of noble materials and details throughout the building creates a sleek style with a touch of luxury vintage, all executed by local craftsmen," the team said. Other projects by S9 Architecture include a giant ferris wheel currently under construction on Staten Island and a massive co-working building in the Brooklyn Navy Yard that is slated to open later this year. Photography is by Miguel de Guzman unless otherwise mentioned.